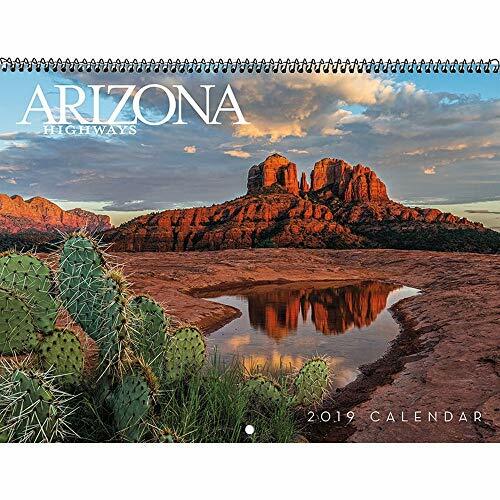 Arizona Highways Classic 2019 Wall Calendar: Arizona Highways Classic 2019 Wall Calendar13 month full-color photographs Arizona map on back coverWall CalendarMedium Square GridSpiral Binding12 month Calendar9'' X 12''Keep track of birthdays, anniversaries, doctor appointments, and every important event! High quality, FSC paper.Perfect for the wall of your kitchen or home office! Includes all major public and culturally significant holidays.Plenty of space for notes, important dates, contacts, and other events.Why Calendars?Does your room need some color but you can’t decide on a piece of art? Do you want to redecorate but are on a budget and don’t want to break the bank? Wall calendars are the world's most popular calendars with style and unique themes for every interest from art to animals, religion to meditations, family organizers and children’s themes. Fill your walls with life and keep them fresh all year with a beautiful and affordable calendar. The wall calendar format gives you enough space to keep yourself organized and provide breathtakingly beautiful decor for any room, or surface, in your home. A calendar is easy to glance at and see what responsibilities you have coming up this month, so make sure you stay organized through the year! You can personalize your calendar, too, with different colors for appointments and trips, add stickers or stickie notes for a quick reference, or create your own system of symbols and abbreviations. Track appointments, anniversaries, birthdays and more! Or, cut out and frame your favorite images for year-round art. Wall calendars make great gifts for any and every occasion! The most common wall calendar size is 12" x 12" but sizes do tend to vary from large poster sizes to small mini-calendars or desk calendar. Check out each calendar’s specifications for an exact size. Shop our vast selection of high quality wall calendars. If you have any questions about this product by Arizona Highways Magazine, contact us by completing and submitting the form below. If you are looking for a specif part number, please include it with your message.